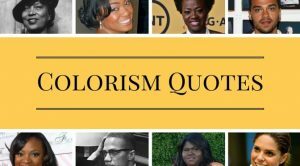 You are here: Home / News / Is Tan the New Black: Colorism in 2018. Is Tan the New Black: Colorism in 2018. (ThyBlackMan.com) For as long as we, in the black community can remember, there has been a sort of value placed on black people who tend to be of a fairer complexion. Since the days that our ancestors endured the horrors of slavery when the slave owners would place blacks of a lighter skin tone in the main house, while the darker slaves were made to till in the fields, there has been a forced divide between black people of varying complexions. When the slave owners would commit rapes against the female slaves, resulting in the birth of a biracial child, history shows that there was a hierarchy dictating the way that the slaves were treated. Let’s be honest, a slave is a slave; however, causing the division, and mistrust between the two sets was a well-designed scheme by the caucasian slave-owner that had such potency and venom, that it has lingered, and in many cases, subconsciously permeated the psyche of many modern-day Blacks. On nearly every college campus in the United States, in Africa, and some in the Caribbean, there are Black fraternities and sororities. The origin of those organizations goes back to not allowing us access to the organizations founded by caucasian people, so Black men and women decided that they would organize their own fraternities and sororities. The first result was Alpha Phi Alpha Fraternity, Inc, and shortly afterwards there came Alpha Kappa Alpha Sorority, Inc. These two organizations were monumental in the fact that they allowed access to having a sense of togetherness and bonding for the black collegians who were not welcomed into other Greek-letter organizations. The downside to these two organizations is that they were still not all-welcoming. One can understand why these organizations would have a certain level of exclusivity, as any organization at the collegiate level should want the best and brightest…but how productive or inclusive is the situation if the brightest literally translates to fair skin? Please be mindful that this is neither a condemnation, nor an endorsement of any organization; however, the fact that these two organizations were said to have a paper bag test,(meaning that the paper bag was compared to the person’s skin tone, and if said skin tone was darker than the paper bag, the person was not a good fit), is problematic and it perpetuates the same divisive ideology that was beaten, both physically and psychologically, into our ancestors who were enslaved. The fact that the founders of the Black fraternities and sororities would, in essence, commit the same heinous act of segregation and separation is, in itself, an example of how some of us see ourselves, and our fellow Black men and women. Fast forward to the cultural shift that afforded us a platform to express ourselves through art on a global media scale, and the perpetuation of fair-skin (women in particular) being more favorable than darker skin, was and still is, clearly evident in music videos, magazines, and on social media. Have we progressed in our thoughts of fair skin being superior or more attractive? Have we advanced in our consciousness by realizing that black is black? On the regular, we can hear black men say things like, “I want me a redbone”, “I like them yella”, “Light skin is the right skin”, and “I don’t want no dark butts”. All of these phrases are offensive and tend to reduce women to their skin tones. While I realize that the majority of Black men do not feel this way, we also see regularly, a large amount of men who exhibit this through dating choices and social media followings. In addition, I have also personally known women with darker complexions, who tend to seek out fair skinned men with certain hair types. The idea that we as a people have not advanced further than this is troubling and dare I say toxic. Moving forward, how de we as a people move past the psychological warfare that has been waged on our psyche, our value system, and our self-worth? At what point do we push past the atrocities committed toward our ancestors, and at least take steps toward healing? I do realize that after 400 years of conditioning, it is impossible to think that the damage can be reversed within a couple of years. It will take more than a natural hair movement, more than Black men publicly praising melanin on social media while privately engaging in behavior to the contrary, and more than a high grossing film that shows us a technologically advanced land uninhabited and unspoiled by the presence of colonizers. It is going to take truth, it will take sincerity, it will take commitment, and it will take the willingness to have meaningful and sometimes uncomfortable discourse that will probably hurt some people’s feelings, before the healing begins. I have faith in my people, and I believe that by doing the work, we can come to the understanding that seeing each other as our reflections will influence the way that we share this space. Also feel free to view more of this talented work over at; TBFB. This is a perennial topic. It has been written about and discussed generation after generation after generation. I do not have a solution, but I do have some advice. You are the master of your ship. No matter what skin color you are, walk tall, be proud, love yourself and all your people. Continuing to assert this borders on an autistic, tone-deaf man who loves to make straw man arrangements. Its a moniker/ a group-based word used to describe melinated/black people. This is confusing and stupid brother…. You’re making yourself look “mentally ill” or some coonservative. Regardless of what people called themselves, they could not change the colors of the spectrum. i don’t get facts from people in error who refuse to acknowledge what their own eyes see. Your attempts to correct people when you walk in darkness are unproductive. I don’t like lies. I like being called what I am and if you can’t tell the difference between black and brown, you need help. I prefer facts instead of brainwashing from oppressors. You are proving my point. Black is the “color” of my shoes, my belt and my car tires, not my skin. You have been so indoctrinated that you are willing to ignore your own eyes. Until you wake up you are just making noise instead of stating facts. Next! You(Ya’ll) haven’t done anything to the community compared to them, therefore your rhetoric is garbage. Put in that work and I’ll believe you, until then…. Is Tan the New Black is a very well written article and I appreciate the intellect behind it. My only thought is there may be a slight potential for over analysis of information. Example; every person in the world has different tastes in food, clothes etc. So is what we are seeing really associated with slavery? I am not saying that it isn’t, but just a thought of maybe we are reaching to far into the information? Thanks for the intellectual stimulation.